Belmont’s popularity as a place to settle down and call home seems to have increased in recent years. Its an easily accessible community from points south of here using Rt 106 and Interstate 93, making it a great commuter location. Belmont also has become increasingly recognized for having a great school system, which is ranked very high for its academic programs and also boasts a new high school that was constructed in 1998. Belmont is also a place to look for that vacation or waterfront home. With a fair amount of frontage on Lake Winnisquam and Silver Lake you can enjoy a variety of water sport activities. 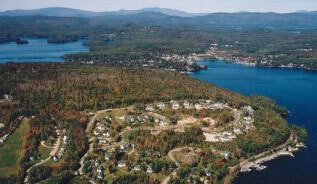 You’ll find a new community beach on Lake Winnisquam, a great marina, and campgrounds. Lake Winnisquam is a much more laid back kind of lake experience then her big sister Winnipesaukee. Encompassing about 4,264 acres, it is roughly 1/10 the size of the Big Lake so you’ll find mostly pontoon boats and smaller bow-riders on this lake. You won’t find the mega mansions on these shores that are so prevalent on the Big Lake, but rather smaller cottages and more modest waterfront retreats. Belmont has a population of around 7,300 residents and covers a little over 31 square miles. Belmont has a wide mix of residential and commercial enterprises such as car dealerships, home good stores, hardware shops and all the shopping conveniences you’ll ever need at the Belknap Mall on Rt 3 or a short drive down to the outlet mall at Exit 20 in Tilton.